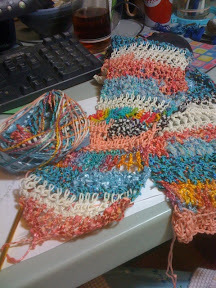 I'm currently working on a light summer scarf made from a 'magic ball' - a ball of yarn composed of lengths of many different yarns. For a control freak like me it's a little unsettling not knowing what yarn will turn up next. But lots of fun as it turns out. This scarf is looking great! I have such a hard time making things without pre-planning ... the magic ball idea sounds like such fun! I know - I'm the same way! This ball gave me a little consternation at first but when I finally 'went with it' the experience has smoothed out a bit.